The British Commonwealth of the Bahamas serves as an important transit area for migrants from Cuba and Haiti, as well as increasingly from African countries, like Nigeria. It has strict immigration laws in place governing entry and residence, and the law provides for criminal sanctions for violations of its Immigration Act. Watchdog groups have reported appalling conditions at the country’s sole dedicated migrant detention facility—the Carmichael Road Detention Centre—and there have been numerous reports of abuse at the facility. Undocumented children are detained pending their removal from the country, as are asylum seekers while their claims are being processed. The Immigration Act (1967), which has been amended several times, contains provisions for the entry, residence, transit, and exit of migrants in the Bahamas, as well as for the arrest, detention, and deportation of irregular migrants. The act also contains provisions for the imposition of criminal sanctions for status-related violations. Grounds for detention. Section 9 of the Immigration Act grants powers to any immigration or police officer to arrest, without a warrant, a non-citizen who is suspected of committing an offence under the Immigration Act. Immigration officers have the authority to detain anyone refused entry, pending removal from the country (Section 25(4)). In addition, any foreign national apprehended in the country after landing in contravention to the act is subject to detention and removal under Section 25 (Section 26). According to Section 22, a person can be refused entry if he/she, inter alia, is not in possession of a valid ticket or permit; has been convicted of a crime punishable with imprisonment of at least three years; is considered to be, in the opinion of the Board of Immigration, “undesirable”; falls within the Minister for Immigration’s “prohibited class of persons”; or is incapable of supporting herself or dependents during stay in country. Anyone listed on the Board of Immigration’s “Stop List”—a list that contains the names of non-citizens not currently in the Bahamas who have conducted or are likely to conduct themselves in an “undesirable” manner—can also be refused entry to the country (Section 24). Anyone refused entry can be issued a removal order and the “master” of the vessel that brought the foreign national to the Bahamas is responsible for removing the migrant. Immigration officers have the authority to place such foreign nationals on board the vessel on which they will depart (Section 25). Section 27 stipulates that the master of the vessel that brought the foreign national to the Bahamas is responsible for covering costs associated with detention and removal. Section 40 provides for the deportation of non-citizens who have landed or remained in the country contrary to the provisions of the Immigration Act; have been convicted of an immigration offence or any offence punishable with death or imprisonment of at least two years; or have been deemed an “undesirable” person. The Minister for Immigration may issue a deportation order that requires a person to leave the country within a specified time-frame and prohibits him/her from returning. The Governor-General has the authority to detain persons issued a deportation order until deportation is possible (including on board a ship or aircraft about to leave the country); and anyone whose case has been recommended for deportation (Section 41). Access to appeals. Migrants who were lawfully in the Bahamas prior to the issuance of a deportation order are entitled to appeal the order. This must be done in writing to the Governor-General within seven days following the date the order was issued (Section 40 (2)). Migrants cannot be detained during this seven day period (Section 41 (5)). Length of detention. There is no maximum length of detention specified in the law. According to U.S. State Department, the typical length of detention can vary greatly depending on the nationality of the detainee and is largely dependent on the willingness of governments to re-admit their nationals as well as on the availability of funds to cover repatriation. Haitians are generally repatriated within one week; Cubans can be held for much longer periods (USDS 2011). Criminal non-citizens. Foreign nationals convicted of crimes other than immigration violations are held at Fox Hill Prison, where they reportedly can remain for weeks or months after serving their sentences as they await deportation (USDS 2011). Minors. There do not appear to be any specific provisions for minors or other vulnerable persons in the Immigration Act. According to the U.S. State Department, children have reportedly been detained for months without access to education (USDS 2011). One staff member working at the country’s sole dedicated migrant detention centre—the Carmichael Road Detention Centre—told the Global Detention Project, on background, that children are detained with their mothers alongside other women at the facility (Carmichael Road Detention Centre 2011). Gender segregation. While the Immigration Act does not explicitly provide for the segregation of men and women in detention, in practice, men and women are detained in separate sections of the country’s the Carmichael Road detention facility (Carmichael Road Detention Centre 2011). Asylum seekers. The Bahamas became party to the 1951 Refugee Convention and the 1967 Protocol relating to the Status of Refugees in 1993; however, the country has yet to enact legislation that fulfils its obligations to the Convention (BIS 2011; USDS 2011). According to multiple sources, asylum seekers are detained at the Carmichael Road Detention Centre while they are being processed (Carmichael Road Detention Centre 2011; BIS 2011). In May 2011, UNHCR officials met with Bahaman authorities to discuss obstacles to the protection of refugees and asylum seekers in the Bahamas and to explore ways in which UNHCR could support the Bahamas with training, and legal and technical advice (BIS 2011). In May 2011, UNHCR issued an advisory statement on the return of Haitians following the devastating earthquake in January 2010. It stated, “Despite the recent elections and the positive outlook that they bring to the recovery of the country, the Haitian State, weakened by the earthquake, cannot yet ensure that vulnerable or disabled people, people with health problems or victims of sexual abuse in Haiti would receive sufficient or adequate care by the State in case of return. In this context, governments should refrain from conducting returns to Haiti. Given the current situation prevailing in Haiti, OHCHR and UNHCR would like to appeal to Governments to renew, on humanitarian grounds, residence permits and other mechanisms that have allowed Haitians to remain outside the country” (Bahamas Press 2011). Despite this appeal, press reports indicate that in August 2011 the Bahamian Immigration Department repatriated 115 Haitian migrants to Port-au-Prince, Haiti, on a charter flight, including 76 men, 32 women, and eight children; 86 of those repatriated had arrived in the Bahamas irregularly on 1 August 2011; 29 others had been taken to the Carmichael Road Detention Centre after being found without proof of status (The Tribune 2011). Previously, in January 2011, a group of 54 Haitians entered the Bahamas and were subsequently detained at the Carmichael Road Detention Centre pending their repatriation to Haiti (The Nassau Guardian 2011). Criminalization. Section 19 stipulates that “Any person landing or embarking in the Bahamas in contravention of this section shall be guilty of an offence,” and is liable to pay a fine of up to 300 dollars and/or imprisonment for up to 12 months” (Section 19(2)). The Director of Immigration has the authority to issue a removal order to any person who is convicted of an offence and who has been sentenced to imprisonment. The convicted person can be placed on board any ship or aircraft about to leave the Bahamas prior to the completion of their sentence and are deemed in legal custody until the departure of such ship or aircraft (Section 19 (3)). In addition, anyone who fails to present valid travel documents or who presents forged or false documents is in violation of the Immigration Act (Section 37). Persons who bring irregular migrants into the Bahamas in violation of the Immigration Act are also in violation of the law and can be fined or imprisoned (Section 19(4)). In July 2011, acting Prime Minister and Minister of Foreign Affairs, Brent Symonette, said the Department of Immigration faced ongoing challenges with many migrants using forged documents and Bahamians helping illegal immigrants evade the law. He said, “We may have to look at the laws regarding harbouring of illegals and start charging people who harbour illegal immigrants” (Nassau Guardian 2011). The Bahamas operates one dedicated immigration detention facility—the Carmichael Road Detention Centre, which is located in New Providence (Carmichael Road Detention Centre 2011; USDS 2011; Government of the Bahamas 2009). Additionally, reports suggest that Fox Hill Prison (aka Her Majesty’s Prison), located in Nassau, is used to confine people in a form of immigration-related detention. According to the U.S. State Department, foreign nationals imprisoned for crimes not related to immigration status continue to be confined at the prison after serving their sentences as they await deportation (USDS 2011). Carmichael Road Detention Centre. There is seemingly contradictory information about the Carmichael Road facility. For instance, regarding its size, the U.S. State Department reports that the detention centre has a capacity to hold up to 500 detainees, with tent space for an additional 500 (USDS 2011). However, a December 2010 press report stated that there were some 70 people at the facility at the time, and only 50 beds available to accommodate them. According to this report, one of the dormitory buildings was destroyed in late 2008 during an alleged detainee arson attack, and that since then bed space had been severely curtailed (Lowe 2010). A staff member at the Carmichael Road facility, who agreed to speak with the Global Detention Project on background only, confirmed some of the information above and challenged other claims. She said the facility had a total capacity of 500, but that two of the centre’s dormitories are currently down, leaving only some 100 beds available to accommodate immigrant detainees. This source said that tents are not used to accommodate detainees at the facility (Carmichael Road Detention Centre 2011). Women and men are reportedly detained separately and children under the age of 14 are held in the women’s dormitory (Carmichael Road Detention Centre 2011; USDS 2011). Children reportedly have no contact with their fathers except during weekly visitation periods (USDS 2011). The U.S. Department of State report claimed that children were held for months without access to education (USDS 2011). In December 2010, a detainee claimed that the level of hygiene at the Carmichael facility was despicable. Included in his allegations were reports of over-flowing toilets; insufficient food; insufficient bedding; and sexual assault (Lowe 2010). In response to the allegations, Immigration Minister Brent Symonette said that the claims would be investigated, but that “if conditions are uncomfortable then people shouldn’t break the law. … [T]hose in the Bahamas working illegally should regularise their status or leave immediately.” The previous Minister for Immigration had promised a report would be commissioned into conditions at the facility; as of August 2011 it had not been published (Lowe 2010). Amnesty International has repeatedly criticised the conditions and treatment of detainees at the Carmichael facility (AI 2009; AI 2004; AI 2003). In a 2009 statement, AI pointed to alleged beatings and mistreatment of detainees; insufficient bed space; and the absence of any independent review of the allegations of mistreatment made by detainees (AI 2009). According to the U.S. Department of State, organisations providing aid to detainees—including counselling services and religious instruction—had regular access to the detainees at the facility (USDS 2011). When asked whether such organisations were permitted to access and assist detainees at the facility, a Carmichael staff member told the Global Detention Project that they would need to contact the director of the facility to arrange such access. According to this staff member, the consuls were the main source of assistance to their country nationals detained at the centre (Carmichael Road Detention Centre 2011). According to a September 2010 media report, the Royal Bahamas Defence Force Commando Squadron is charged with upholding the internal and external security at the Carmichael Road Detention Facility (BIS 2010). In September 2011, two members of the Royal Bahamas Defence Force Commando Squadron travelled to Miami, Florida, to tour the Krome Service Processing Centre. The object of the tour was to discuss best practices in immigration facility detention management in the United States. The Bahamian officials reportedly met with several officers from the U.S. Immigration and Customs Enformcement to discuss issues regarding irregular migration, detention standards, medical care, detainee in-processing, detainee treatment, and facility security. The visit, sponsored by the United States Northern Command and the U.S. Embassy in Nassau, was the second of a series of exchanges on detainee operations (BIS 2010). The government of the Bahamas operates one dedicated migrant detention centre—the Carmichael Road Detention Centre—as well as a prison that is reportedly used to hold non-citizens convicted of crimes while they await deportation Fox Hill Prison (aka Her Majesty’s Prison) (USDS 2011). When operating at full capacity, the Carmichael centre has beds to hold up to 500 people, although as of August 2011 bed space was reportedly limited to 100 because two of the centre’s dormitories were temporarily shuttered (Carmichael Road Detention Centre 2011). As of 18 August 2011 there were 72 migrants (irregular migrants and asylum seekers) being held at the centre, including a large group of Haitians and Cubans, in addition to migrants from Jamaica, Sri Lanka, Ghana, Guiana, Honduras, Iran, Kenya, Nigeria, China, Montenegro, and Sierra Leone (Carmichael Road Facility 2011). According to the U.S. Department of State, the highest occupancy at any one time during 2010 was approximately 252 (USDS 2011). The country reportedly hosts around 30,000 undocumented Haitians (USDS 2011). As of January 2011, there were nine asylum seekers in the Bahamas (UNHCR 2011). According to a May 2011 media report, the Bahamas, with the assistance of UNHCR, granted refugee status to more than 100 Cuban nationals, in addition to other foreign nationals. At the time of the media report, there were seven Cubans, four Sri Lankans, and one Iranian detained at the Carmichael detention facility who had requested asylum (BIS 2011). According to acting Prime Minister and Minister of Foreign Affairs Brent Symonette, at the end of June 2011 there were “a number of nationals” being held at the Carmichael Road Detention Centre whose repatriation was difficult due to visas being required for each of the countries that the migrants must pass through en route to their countries of origin (McCartney 2011). Repatriations to Cuba was also a difficult process, particularly if the migrants had been outside of Cuba for more than 11 months. According to Symonette, the Department of Immigration has a total budget of around $1,000,000, which must also cover the repatriation of migrants to countries in the Caribbean, and also African countries, such as Nigeria (McCartney 2011). Amnesty International (AI). 2009. “Fear for safety / ill treatment: Bahamas: Detainees at the Carmichael Road Detention Centre.” AI Index: AMR 14/01/2009. 6 March 2009. Amnesty International (AI). 2003. Bahamas: des détenus oubliés? Réfugiés et migrants mis en detention: Cas d’appel. AI Index : AMR 14 March 2003. Amnesty International (AI). 2004. “The Bahamas: Amnesty International calls for a commission of inquiry into conditions at the Carmichael Detention Centre.” AI Press Release. AI Index: AMR 14/002/2004. Bahama Islands Info (BIS). 2010. “Royal Bahamas Defence Force officers participate in tour of Florida’s primary Immigration Detention Centre.” BIS. 11 September 2010. http://bahamaislandsinfo.com/index.php?option=com_content&view=article&id=6510:royal-bahamas-defence-force-officers-participate-in-tour-of-floridas-primary-immigration-detention-centre&catid=34:Bahamas%20National%20News&Itemid=147 (accessed 29 June 2011). Bahama Islands Info (BIS). 2011. “Bahamas and UNHCR discuss challenges.” Bahamaislandsinfo.com. 3 May 2011.http://bahamaislandsinfo.com/index.php?option=com_content&view=article&id=8671:bahamas-and-unhcr-discuss-challenges-&catid=34:Bahamas%20National%20News&Itemid=147(accessed 17 August 2011). Bahamas Press. 2011. “UNHCR Advisory to the FNM Government on Repatriation.” Bahamas Press. 2 July 2011.http://bahamaspress.com/2011/07/02/unhcr-advisory-to-the-fnm-government-on-repatriation/ (accessed 17 August 2011). Undisclosed staff member at the Carmichael Road Detention Centre. Telephone interview with Cecilia Cannon (Global Detention Project). 18 August 2011. Geneva, Switzerland. (Source asked to remain anonymous). Immigration Act (1967). Immigration: Chapter 191: Statute Law of the Bahamas. Government of the Bahamas. Lowe, Alison. 2010. “Detainee describes ‘terrible’ experience at Detention Centre.” The Tribune. 6 December 2010.http://www.tribune242.com/Print/06122010_aldetention_new_pg1 (accessed 7 February 2011). McCartney, Juan. 2011. “Brent Symonette says: Complicated deportation processes, fraudulent immigration documents and Bahamians harbouring illegal migrants are just a few of the issues that continue to plague the Department of Immigration.” The Nassau Guardian.http://www.thenassauguardian.com/index.php?option=com_content&view=article&id=11634&Itemid=27 (accessed 17 August 2011). The Nassau Guardian. 2011. “Bahamas: Illegal Haitian immigrants are cholera-free.” The Nassau Guardian. 5 January 2011. The Tribune. 2011. “115 Haitian Migrants Repatriated this Week.” The Tribune. 12 August 2011.http://www.tribune242.com/news/08122011_repatriation_news_pg5(accessed 17 August 2011). United Nations High Commissioner for Refugees (UNHCR). 2009. 2008 Global Trends: refugees, Asylum-seekers, Returnees, Internally Displaced and Stateless Persons. UNHCR. 16 June 2009.http://www.unhcr.org/pages/49c364c4d6.html (accessed 29 July 2009). United States Department of State. 2010. 2009 Human Rights Reports: The Bahamas. 11 March 2010.http://www.state.gov/g/drl/rls/hrrpt/2009/wha/136099.htm (accessed 26 July 2010). United States Department of State. 2011. 2010 Human Rights Reports: The Bahamas. 8 April 2011.http://www.state.gov/g/drl/rls/hrrpt/2010/wha/154492.htm (accessed 20 August 2011). §30 (d) Ensure that refugees and asylum seekers, in particular women and girls, are not penalized for illegal entry and stay in the country, that detention of asylum seekers is used only as a last resort , where necessary and for as short a period as possible, and that safeguards against refoulement are fully implemented; improve the conditions in detention faci lities for women asylum seekers in accordance with international standards; and ensure the provision of adequate health facilities and services, in particular for pregnant women. Committee on the Elimination of Discrimination against Women. 'Concluding observations of the Committee on the Elimination of Discrimination against Women: Bahamas'. CEDAW/C/BHS/CO/1-5. 27 July 2012. §21. The Bahamas is located in a complex migratory environment and exposed to substantial irregular migration flows. In 2009, the International Organization for Migration (IOM) estimated that between 20,000 and 50,000 undocumented Haitians were living in the Bahamas. The Immigration Act of 1967 contains provisions on the entry, residence, transit, and exit of migrants, and also criminalizes violations related to immigration status. Immigration officers have the authority to detain anyone refused entry pending removal from the country (sect. 25, para. 4). Any foreign national apprehended in the country after having irregularly crossed the Bahamian borders is subject to detention and removal (sect. 26). §22. The Act stipulates that irregular migrants are liable to pay a fine of up to US$ 300 dollars and/or imprisonment for up to 12 months (sect. 19, para. 2). Irregular migrants have been detained in the Carmichael Road Detention Centre, the only dedicated immigration detention centre in the country, which is located in Nassau. At the time of the Special Rapporteur’s visit the centre housed 133 detainees comprising 12 to 15 different nationalities, including several detainees from India, the Dominican Republic, Cuba, Haiti and Colombia, one from Kenya, one from Eritrea and one from Ghana, among others. The Special Rapporteur expressed concern with regard to the poor conditions and the length of detention, which do not meet international standards. The centre was obviously overcrowded, as the main section for men had a capacity of only 70 beds and one room for sanitary facilities. 23. Although no children were present in the detention centre at the time of the visit, the Special Rapporteur notes with deep concern that children have been detained with their mothers for lack of alternative facilities and measures to cater to this population of undocumented migrants and in violation of all relevant international human rights and humanitarian norms. This is all the more alarming since, according to IOM, the majority of persons entering the Bahamas are Haitian children under the age of 14. §24. Some of the migrants informed the Special Rapporteur that they had been detained for over 12 months, one of them for several years. The authorities justified the lengthy detention of certain individuals as a result of challenges in communicating with certain countries of origin to receive identification and travel documents in order to proceed with the removal process; but also mentioned complications in obtaining transit visas for those whose return travel itineraries transit through several countries. §25. According to the testimony of the Dominican women who were detained at the time of the Special Rapporteur’s visit, immigration officers found them blindfolded in a house in the island of Grand Bahama, where their smugglers had abandoned them after telling them they had reached the United States. They were immediately brought before a judge and sentenced to pay a US$ 300 fine for the offence of irregular entry, without ever being properly screened to determine whether they had been trafficked. It is only when they reached the undocumented migrants detention centre in Nassau that they finally received medical screening. That testifies to the poor implementation of screenings to identify victims of trafficking, and to detect persons in need of humanitarian protection. Despite the fact that one of the women was three months pregnant she remained in detention awaiting the execution of the removal order. §28. The Special Rapporteur received information that the Government of the Bahamas has started to consider alternatives to detention for refugees, asylum seekers and, on certain occasions, for migrants, based on humanitarian grounds. The Government also took steps in 2012 to provide permanent residency for several long-term recognized refugees, most of Cuban and Haitian origin. Those initiatives are welcomed and should be extended to all persons in need of international protection. §80. ...the country lacks a comprehensive assessment of the trends and scope of trafficking, and victims are rarely identified or referred to assistance programmes. The restrictive immigration policy leading to the Government’s rapid deportation of migrants, who arrive mainly by boat, especially from Haiti and the Dominican Republic, informed by existing memorandums of understanding with the countries involved, may lead to the arrest, detention and deportation of potential victims of trafficking without providing the opportunity for identification and assistance. The Special Rapporteur’s fears are heightened by the fact that there is a capacity gap in terms of ability for quick and accurate identification of victims of trafficking. Special Rapporteur on trafficking in persons, especially women and children. 'Report of the Special Rapporteur on trafficking in persons, especially women and children, Joy Ngozi Ezeilo: Addendum: Mission to the Bahamas'. A/HRC/26/37/Add.5. 5 June 2014. Report of the Working Group on the Universal Periodic Review: Bahamas. 22 March 2013. A/HRC/23/8. From Mexico to the Bahamas, Mauritania to Lebanon, Turkey to Saudi Arabia, South Africa to Indonesia, Malaysia to Thailand, immigration-related detention has become an established policy apparatus that counts on dedicated facilities and burgeoning institutional bureaucracies. Until relatively recently, however, detention appears to have been largely an ad hoc tool, employed mainly by wealthy states in exigent circumstances. 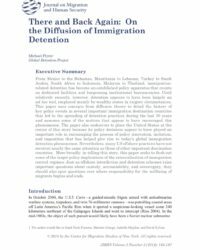 This paper uses concepts from diffusion theory to detail the history of key policy events in several important immigration destination countries that led to the spreading of detention practices during the last 30 years and assesses some of the motives that appear to have encouraged this phenomenon.